So it’s your big day and everything has to be perfect. Dress, tux, flowers, food, music, invitations… they’ve all been checked off the list… but wait! What about the wedding dance? What do you do about that? You’ve never danced in front of people in your entire life… at least not in the spotlight. Now what? Just the thought makes you nervous and you don’t know where to begin. Dawn and I were in a similar boat about 10 years ago. We were about one month out from the big day and most details were in the finalizing stage of the planning process. Dawn was stressed to the max when she tackled the whole dance issue. She did what most people do and called the local ballroom dance studio for a few lessons. Having never danced before, the idea didn’t appeal to me, but I humored her and went along with it as not to add to her stress levels. Fortunately for us, our instructor was welcoming, encouraging, and made the lesson fun. The idea of a wedding routine was posed to us and we signed up for some more lessons to learn it. The big day came, and the routine was a hit (yes, the photo on the right is actually us). Unlike many couples, we decided to keep learning dance after the wedding. I credit this to the welcoming personality of our instructor. Since then, we became interested in vintage swing dances and, as they say, the rest is history. So, ten years later, countless hours chalked up on the dance floor, and having since become instructors, what is our advice on wedding dances? Well, let me say that prepping people for wedding dances is not our specialty. 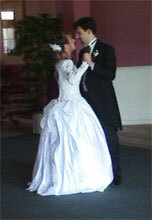 However, over the years, we have worked with some couples who wanted to do a swing dance for their wedding. So the advice we give is based of a combination of our own wedding dance, looking back on it now with years of dance experience, having worked with some couples getting married, and having since attended many weddings. So what wisdom can we relay? Choose your song wisely. The music can really make or break your dance. You may love the lyrics or meaning of a song, but the song may be exceedingly difficult to dance to. It might be too slow (like ours was) or too fast. Also be careful not to pick a trendy song that you may one day cringe when you hear (we were guilty of that too). You don’t want to tell your kids about your wedding song and have them giggle and get that “mom and dad are so old” look. Keep in mind that there are good reasons timeless songs are… well… timeless. Routines = Stress. Special choreography designed just for you and tailored to the meaningfulness of your song just sounds like a perfect compliment to your big day. Not to mention, choreographed dance routines are the in thing. I’ve even seen some studios making a special wedding dance that is unique to just you. Others teach “assembly line” style wedding routines. But let’s think about it for a minute. Dance routines can be stressful for experienced dancers, let alone people just starting out. Learning a routine is one more element of stress in an already hectic period in your life. I can say that from experience. I remember standing at the alter, waiting for Dawn to walk down the isle, running a dance routine through my mind over and over again. My mind should have been occupied with other, more useful, things. We were both nervous about getting it right, and scared how bad it would look if it went wrong, and were so relieved when it was over. It went over well, but could it have been better? In hind site, yes. There is also more to consider beyond the stress of a routine. A lot of thought process goes into memorizing and executing a routine. This is especially true for beginners. This tends to make the actual dancing in the routine look stiff, mechanical, and unnatural. Learn to dance! Believe it or not, it is far easier to learn to dance than to learn a routine. The time you would spend learning a routine can easily be spent becoming comfortable with dancing. It doesn’t have to be complicated. First, work with your instructor to find the kind of dance that works with your song choice (fox trot, waltz, swing, rumba, etc.). Then, learn the basic of that dance and a few core moves. Focus on that dance and become comfortable with it. Practice dancing to your song and songs with similar rhythms. During the time you are learning to dance for your wedding, don’t be distracted by other dances. Studios may try to sell you on “the 10 dances”. You can always learn those later, for now, work on your wedding dance. This way, when you go out to dance for your first dance, you can comfortably dance the basic and some key turns and moves. Will you hit every break and highlight in the song? No. Will people notice? No. What people will notice is that you look comfortable and natural dancing together. That will leave a lasting impression, and, unless all your family and friends are experienced die-hard dancers, you’ll be surprised how much a few basic turns and moves smoothly executed will impress people! Lead in, lead out… it’s so easy! There are some ways to make the few basic turns and moves you know look like a routine, but without all the stress and memorization. The easiest way is to work out what you are going to do at the start and end of the song. In other words, work with each other or your instructor on a fancy way of walking out on the dance floor as the song starts. In addition, work out a special move you’ll do as the songs ends. In between those two points, just dance. Have fun, smile, and lead what moves pop in your head. Want to take it a little further? If your song has a break or crescendo, work out a move to do when you hear that coming. But that is purely optional. The key is to look natural, have fun, and dance what you know. Avoid the crunch! Don’t wait till the last minute to learn to dance for your wedding day! Routine or not, this holds true. If you go to an instructor or studio a week before the wedding, there won’t be much they can do. Any way you go, plan out at least a month in advance. The more time you allow the better your wedding dance will be. If you have a good instructor, learning to dance for your wedding can be enjoyable and a stress relief from the hectic nature of wedding planning. Say cheese! Don’t forget about your wedding photographer! You’re paying good money for great photos, so let’s get the most out of them! A simple dip goes a long way. Yeah, it may be a little cliche, but it’s eye candy and, if done right, looks great in pictures. Avoid the broken back backwards lean. In a nice dip, the lady should feel supported. She should be able to do it in any kind of wedding dress and her feet don’t have to leave the ground. A simple dip can look awesome! Be sure to tell your photographer ahead of time when to expect it. When the time comes, look at the camera and smile! A wedding dance doesn’t have to be complicated to look good. Keep in mind that a routine will be forgotten after the wedding and live only in the video you occasionally dust off on your book shelf. If you learn the basics of the dance that fits your song, you’ll be left with knowing how to dance after the wedding and you’ve laid the foundation for learning more if you so choose. Either way, you looked comfortable and confident on the dance floor for your wedding and you now have something to enjoy together in your married life. Want to stay updated on classes and the Saturday Orlando swing dance? Sign up for the email list! You can email us at info@FlyinFootwork.com or phone 407.766.9849. New to swing dancing? Read our beginner guide.